Customers can submit cases and find knowledge articles. Partners can see and manage sales opportunities. Internal employees can create and see best practices. To provision a portal, you must be assigned to the System Administrator role of the Dynamics 365 for Customer Engagement organization selected for the portal. 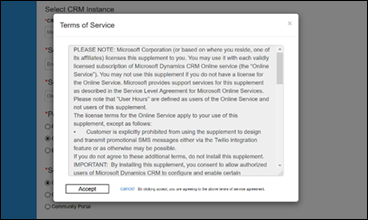 To complete provisioning a portal, after you have purchased a new portal license, return to your Dynamics 365 for Customer Engagement instance. Go to the Dynamics 365 Administration Center page, and then select the Applications tab. Select the application row titled Portal Add-On, and then select Manage. In the General Settings section, enter a Name for your portal. The Name will help to identify the portal and can be changed later. The Type field represents the type of portal subscription (Trial or Production). This is a system field, so it cannot be changed by the user. The value changes based on whether it is trial subscription or paid subscription. For existing provisioned portals, this drop-down list is available on the Portal Details tab and no status is selected by default. This drop-down list is available only for the portals of type production. This field is used by Microsoft to understand the usage pattern of this portal and does not affect any functionality. If you use different names for development lifecycle, please select the one which is closer in purpose. This can be changed at a later point of time once portal is provisioned. In the Portal URL field, enter the subdomain name you want for your portal. You can only use alphanumeric characters or hyphens (-); other characters are not permitted. To change the URL of a portal after it is provisioned, see change the base URL of a portal. To link your portal to a custom domain, see link your Dynamics 365 for Customer Engagement portal to a custom domain. In the Dynamics 365 Instance drop-down list, select the Dynamics 365 for Customer Engagement instance you want to link the portal to. This requires System Administrator or System Customizer role in the Dynamics 365 for Customer Engagement instance you pick to select it. In the Select Portal Language drop-down list, select the default language for your portal. The available languages will depend on the languages that are installed in your Dynamics 365 for Customer Engagement instance. Sample data is only provided in one language, so choosing a default language will also decide how the sample data is translated. Arabic and Hebrew are not supported and will not appear in the list. In the Select Portal Administrator drop-down list, select the Dynamics 365 for Customer Engagement user who will configure, customize, and maintain the portal. All Dynamics 365 for Customer Engagement users who have the System Administrator role in the organization will appear as options. In the Select portal to be deployed section, choose what type of portal you want to create. The options you see are based on the audience you selected. Select Submit, and accept the Terms of Service. After you accept the Terms of Service, the portal will begin provisioning. Provisioning usually takes 30 minutes but can take a few hours depending on the system load. The Name of the portal on the Application tab will change to Name-Configuring while it is provisioning. Navigate back to the portal management page to check whether provisioning has succeeded. When a portal user signs in to the portal for the first time by using an Azure AD credential, a consent page is displayed to all users irrespective of the user or portal type. Sometimes the package installation process or URL creation process can error out. In these cases, the processes can be restarted. If Name-Configuring changes to Name-Provisioning Failed, you need to restart the provisioning process. Go to the Applications page, and select the portal. Select the blue pencil button labeled Manage. Restart Provisioning: Restarts the installation process with the configuration that was previously defined. Change Values and Restart Provisioning: Lets you change some of the values before restarting the provisioning process. Go to the Solution Management page of the Dynamics 365 Administration Center page and check that the package status is Install Failed. If the package status is Install Failed, try retrying the installation from the solution page. Also, be sure to check that a system administrator in Dynamics 365 for Customer Engagement is installing the solution with the default language in Dynamics 365 for Customer Engagement set to the language the portal should be installed in. Some solutions have prerequisites for their installation, so an installation will fail if the prerequisites are not met. For example, to install the Partner Field Service for a partner portal, the Partner Portal and Field Service solutions must have already been installed. If you attempt to install the Partner Field Service first, the installation will fail and give you an error message. The Dynamics 365 Portal app allows you to configure and manage your online platform to communicate and collaborate with customers. When you install Dynamics 365 for Customer Engagement Portal version 9.0 and higher, the Dynamics 365 Portal app, built on the Unified Interface framework, is created out-of-the-box. Open the URL <organization URL>/apps or go to Settings > My Apps. Select the Dynamics 365 Portal app.